How Safe Is Your Child’s School, Camp or Sports Bus? 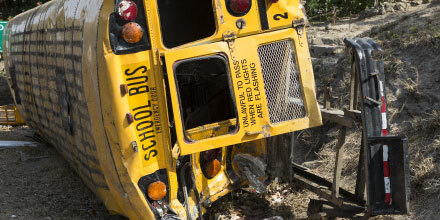 Five School Bus Crashes in Six Days: How Safe Is Your Child’s School, Camp or Sports Bus? As children across the U.S. enter their final days of school, a spate of recent school bus crashes has parents on edge as to whether their kids will return home safely from a commute that many regard as a childhood rite of passage. As these buses are also used for summer camp activities, sports teams, field trips, summer school, and other activities, the risks will continue long after the year-end school bell rings. June 11: A school bus in Middletown, Delaware, overturned when it drove off the road into a ditch, injuring two children. The driver was attempting to avoid a collision with the vehicle in front of the bus. June 7: A tractor-trailer slammed into a school bus that was stopped at an apartment complex along a highway in Collin County, Texas. The bus driver and 14 of the 16 students aboard were taken to the hospital. June 7: Four children and one adult were sent to the hospital after a school bus overturned on the New Jersey Turnpike in Elizabeth. June 7: Two students, a school bus driver, and the driver of a car were sent to the hospital when the car struck the bus as it turned into a high school parking lot in Walkersville, Maryland. June 6: Thirteen students in Egg Harbor Township, New Jersey, were sent to the hospital following an accident in which their school bus driver struck a car in an intersection, causing both vehicles to leave the roadway. The bus driver was issued a summons for careless driving and failure to observe a traffic signal. Of course, in May, a 51-year-old teacher and a 10-year-old student were tragically killed when a school bus transporting 38 fifth-graders and six adult passengers to an end-of-year class trip collided with a dump truck on Route 80 in New Jersey. The school bus driver had 14 license suspensions, eight speeding tickets, a careless driving ticket and a ticket for an improper turn in 2010, according to news reports. Authorities are investigating reports that the school bus driver missed an exit and attempted to make an illegal U-turn. The impact ripped the front cabin of the bus from its chassis, and the mangled bus landed sideways on the median, with motorists rushing to help children escape through windows and emergency exits, as other children were left “hanging from their seatbelts,” as described by one child witness. Those seatbelts may have helped reduce the death toll. But everyone aboard was injured, some critically. Are School Buses Required to Have Seatbelts? Federal law requires school buses that are 10,000 pounds or less to be equipped with lap-shoulder belts. School buses above 10,000 pounds are not required to have seatbelts, but states and local jurisdictions can pass stricter regulations. According to the National Conference of State Legislatures, Arkansas, California, Florida, Louisiana, Nevada, New Jersey, New York and Texas have passed seatbelt laws for larger school buses. But funding has not been appropriated in some states. In 2017, at least 29 states introduced bills that would address seatbelts on school buses. Why Don’t All School Buses Have Seatbelts? According to the National Highway Traffic Safety Administration, large school buses are heavier and distribute crash forces differently than passenger cars and light trucks, and thus seatbelts are not necessary. Instead, children are protected from crash forces through an engineering concept called “compartmentalization,” which involves closely spaced seats that have energy-absorbing seat backs. However, the principles of engineering are of little comfort to children, families, friends, first responders and Good Samaritans touched by the tragedy of a horrific school bus accident. One Good Samaritan driver who assisted at the scene of the fatal May crash in New Jersey described screaming children who were cut, bruised and in pain. Some could walk, while others couldn’t. A few used his phone to call their parents. One child couldn’t find a missing friend. “It was pretty heart-wrenching,” the driver said.